When you employ web-based services on the Internet, SSL certificates are the industry standard for authentication and security. Depending on how you plan to use SSL certificates, mult-use certificates can provide greater flexibility than traditional certificates. Multi-use certificates protect multiple Fully Qualified Domain Names and subdomains, lowering your administrative costs and simplifying certificate installation, management, and deployment. 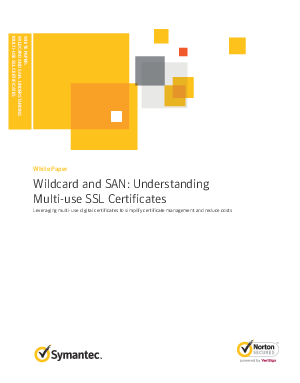 Download this paper for a better understanding of Multi-use SSL Certificates.